Colin White finally agreed to sign an amateur tryout contract with the Ottawa Senators. After the elimination of his college team in Boston, White was looking to turn professional. In hopes of joining the Senators, his side wanted to sign an entry-level contract (ELC). It would have burned off the first year of his deal, bringing him sooner to free agency. White decided that playing hockey anywhere was more important than sitting over an NHL contract. The Senators ultimately got what they wanted, sending him directly to the American Hockey League (AHL). They signed him to an amateur tryout (ATO), preventing them from burning a year off his ELC. “We have spoken to Colin and his advisors at length and we are all in agreement that getting him on the ice to play games in the AHL is what is best for his growth at this moment,” said general manager Pierre Dorion. The Senators and White are in a different situation than Vancouver and Arizona. Those two signed Brock Boeser and Clayton Keller, respectively, to NHL ELCs. Those recent college graduates can develop in the NHL where their teams have little to play for. It is more beneficial for their development to play quanlity minutes in the top league. Oppositely, the Senators are deep in a playoff push and they already have a full roster for the postseason. Putting White in a situation where he will have little space to acclimate himself could do more harm than good. He will instead have the opportunity to play in all situations with a Binghamton club outside the AHL playoff picture. The first thing White will need to adjust to is the higher level of competition. The AHL is no easy league and playing against seasoned hockey veterans will be a challenge. He may receive top line minutes and assignments immediately but still have room for trial and error. The second thing he will need to acclimate to is the schedule. Not as intensive as the NHL, but three games in four nights is a step up from two games a week. If he were to play in Ottawa, White would likely need to play within the top nine forward group. The Senators are uncertain that he would surpass players such as Jean-Gabriel Pageau, Alexandre Burrows or Viktor Stalberg. They certainly won’t want him playing too few minutes on the bottom line. However, if he surpasses expectations in the AHL, the Senators will want him assisting them in the post-season in a meaningful role. Depending on his performance in the AHL, the Senators may sign him to an NHL contract before the season’s end, and he could join them in time for him to play in the NHL playoffs. 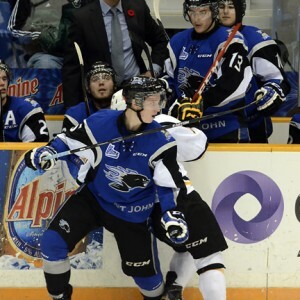 With White soon turning professional, attention will turn towards fellow 2015 draftee Thomas Chabot. In the midst of a record-breaking season in St. John, expectations will be that he should make the team next season. Especially if White makes the jump to the NHL as late as next season, Chabot could do the same. However, the Senators won’t shy away from sending either player to season their professional game in the AHL. They do not feel that it should be harmful or insulting for a promising prospect to spend time there. “Binghamton is important for him to see what pro hockey is all about. A lot of players think you can step in the AHL and it’s really easy. The AHL is a very tough league. Most of our players have played in the AHL. Erik Karlsson played in the AHL. You earn your stripes,” Dorion said in regards to White’s development. Either way, the Senators are excited that their two top prospects are making good progress towards joining them in Ottawa. Both White and Chabot will be happy to make the next step.